WAIST HIGH: Happy 25th Birthday True. 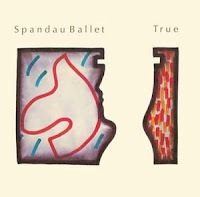 The third studio album by Spandau Ballet, True went to #1 in the UK and became the band's breakout release in America. An all time Waist High favorite, True is "a suite of eight modern love songs, carefully crafted by producers Steve Jolley and Tony Swain from the simplest of arrangements - funk guitar, a super-tight rhythm section, occasional keyboards, and some beautiful percussion and sax neatly deployed, often to spine-tingling effect. But the real star is vocalist Tony Hadley, who at last dropped the artsy, melodramatic edge from his performance and demonstrated that he has one of the finest pop voices ever recorded." The title track went to #1 in 21 countries, and in 1991 was sampled by PM Dawn on "Set Adrift on Memory Bliss," which also went to #1. Composed by Gary Kemp, the original album version of the song "True" is a six-minute "slow ballad-like love song that in part pays tribute to the late Motown artist Marvin Gaye and the sound he helped to establish." The song was the band's only hit in the US, reaching #4. Other singles from the album include "Lifeline," "Communication," "Pleasure," and the stunning "Gold," which showcases the beauty of Hadley's vocals.